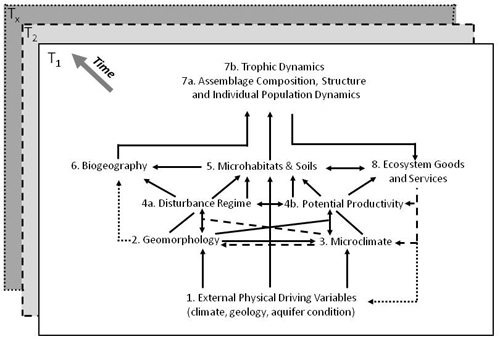 Conceptual springs ecosystem model, showing the interactions among the 8 submodels. T1-TX represents the springs ecosystem from time 1 through time x. Solid lines represent strong, direct effects and dotted lines indicate indirect or uncertain effects. Springs are among the most structurally complicated, ecologically and biologically diverse ecosystems. They are incredibly productive and evolutionary provocative, yet they remain some of the most threatened ecosystems on Earth. Springs exist where groundwater reaches the earth's surface. The water is delivered through a complex and often lengthy flow path through subsurface geochemical, geomorphic environments. This geomorphic template allows springs to support large arrays of aquatic, wetland, and terrestrial species and assemblages. Depending on location, they sometimes include cave and hyporheic biota. Many springs serve as paleorefugia. They can also be long-term stable habitats in which the evolutionary processes of natural selection, isolation, and adaptation (sometimes in extreme environmental conditions) support restricted and endemic species. In ecological time-frames, small, isolated springs in arid regions may be incredibly productive. They may even be the only available water and habitat in that landscape for numerous plant and animal species. Looking at springs from biogeographical perspective, springs often function as islands of habitat. They often contain paleontological remains that reveal a great deal about changing climates and ecosystem responses over time, particularly in arid regions like the American Southwest. In more temperate regions, the differences between springs and surrounding uplands may appear to be subtle. However, studies of Silver Springs in Florida reveal a complex interplay between ground and surface water, as well as aquatic-riparian linkages that characterize springs ecosystem ecology. Springs emerge in both freshwater and marine settings. Recent information on subaqueous springs shows parallels with subaerial springs, including high levels of biodiversity, species packing, productivity, and endemism. Although poorly explored, arid lands springs often appear to function as keystone ecosystems, exerting a vastly disproportionate impact on adjacent ecosystems and regional ecology as compared to non-spring habitats. Several symposia and survey studies of springs have been conducted in the United States. However, springs ecosystem ecology remains a rarely studied and poorly circulated topic. The scope of previous work has been small. Most of these studies have examined a small suite of physical characteristics (e.g. flow and water quality) and individual taxa and biota (e.g. trichoptera, aquatic snails, aquatic invertebrates, and springs biota in general). Their examination of geographic areas also remained restricted. In recent decades, virtually all studies have recognized the threatened ecological condition of springs ecosystems and the imperiled state of their biota. However, human demands for water preclude the protection of springs. The complex, highly interdisciplinary nature of springs research has also handicapped the development of comprehensive, conceptual approaches to understanding springs ecosystems. SSI proposed a general conceptual model of springs ecosystems at the National Park Service website, from a suite of dynamic ecosystem models, process-component mechanistic models, and a state-of-transition framework of human impacts on springs ecosystems. Such an effort is important to ground inventory, assessment, stewardship activities, and monitoring. Until it is more fully quantified and tested, the model will not provide substantial predictive capability, but it is working to expose gaps in knowledge, uncertainty, and previously unrecognized interrelationships among springs ecosystem processes and components. When coupled with rigorous groundwater models and additional research, new insights into springs ecology are likely to emerge.